We can almost touch summer, the nights are finally lighter, the birds are singing and we have enjoyed the odd warm sunny day. We are nearly there folks, summer is in reaching distance away. But our garden is far from summer ready. However, we did manage to get this right last year and be ready when those glorious hot days hit the UK. 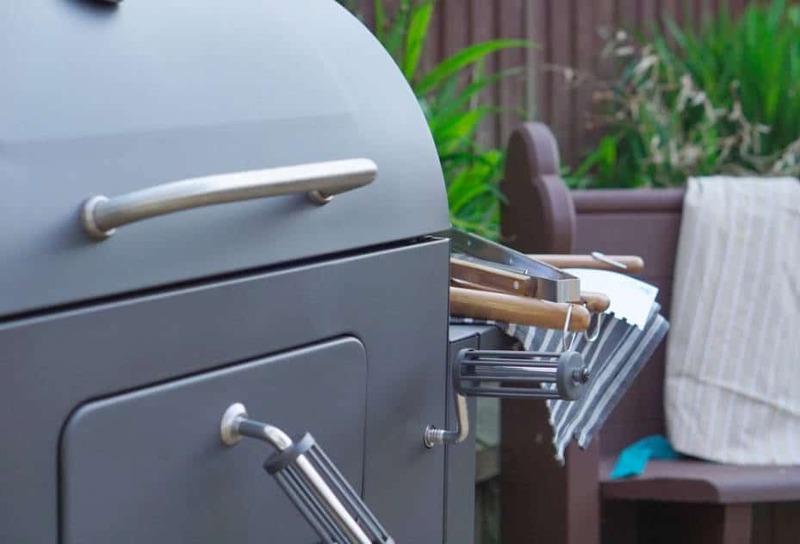 As soon as our long hot summer hit, we were out enjoying BBQs, lazy days and a bit of chilled family time. 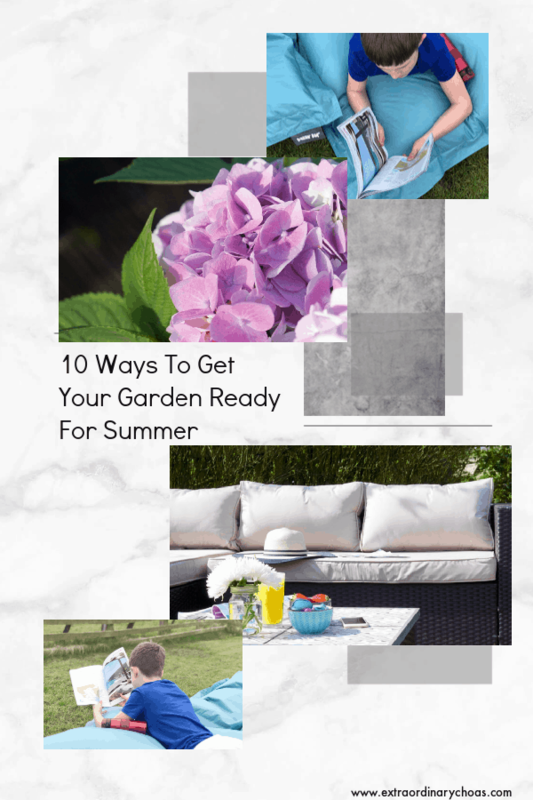 I wanted to share the steps we took to ensure we were one step ahead and help you with your Garden Summer Preparation. Planting, choosing flowers and feeding the grass. This is where it all begins isn’t it? That first weekend you oh so dread when the Jet Wash comes out. And you know it will be a dirt job, but washing away all the build up of winter really is the first step to getting your garden ready for summer. Top area’s to focus on are patio, decking, pots and furniture that has been left out all winter. Top tip, don’t let the kids jet wash. Jack once drew his name in our friends drive way, it took ages to get it out!!! Part of our early garden summer preparation is painting. Any pots that have faded over the winter, giving the garden fence a freshen up and painting decking. There are so many opinions on what quality of decking paint you should use. However we have found that no matter what you use, if your garden is exposed to the elements then the decking will fade throughout the year and need a coat of paint. Use a large tub of one coat fence paint and brush on with a large stiff hand broom. This not only saves so much time, but also gets in all the grooves. Start by turning over borders and feeding soil before planting. Decide on a colour theme, or areas you want to introduce colour. 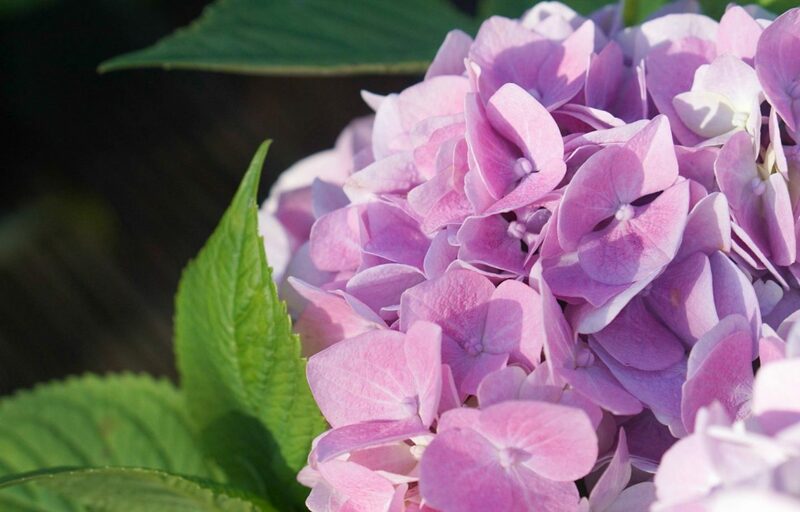 But also think about creating an impact on the ground, looking for ground covering plants that have colour or flowers to go in low pots or at the front of borders. Then build higher as you work towards the back of borders. Think hard and plan to have colour and flowers all year round. This is our biggest mistake and one we are still working on. And feed the grass, look for patches that need revitalising and sprinkle some grass food to give it a lease of life. Look for plants that create height such as bamboo that can be planted into clumps to create height and volume. Another great tip for garden summer preparation is to grab a few packets of wild flower seeds from the supermarket. The packets come in different colours to allow you to colour theme areas. Decide what sort of pots and hangers you are going to go for and get them planted around May to avoid harsh frosts. Plants such as trailing lobelia, pansies, geraniums and daisies are perfect for baskets. and as long as you dead head and water them daily they add so much colour to your garden and last all summer long. We usually plant up about 12 pots or varying sizes and 6 hangers (Last year we used hanging burlap sacks) and place them in bunches around the patio area. Assuming you have jet washed all furniture, wash all cushions and wood furniture will need a coat of paint or varnish. Clean under the rim of glass tables so its fresh and ready for alfresco dining and make sure your summer entertaining space is ready to go. Also dig out the garden plates and glasses from their winter hiding place ready for BBQ season and cocktail afternoons. The chill out area is our favourite area in the garden, we are a huge fans of garden bean bags. This is the place we spend most of our time on hot summer weekends. 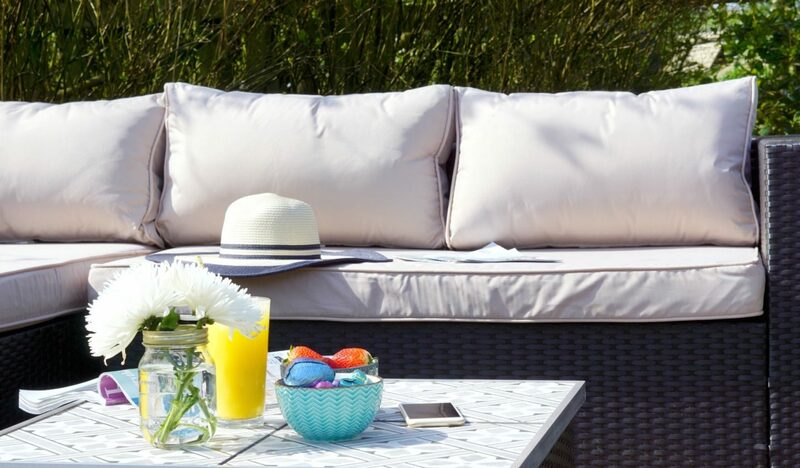 Create an area where you can chill as a family, beanbags are much comfier than deckchairs. They make a great summer chill area for teens. But if I am totally honest in our garden its also a little haven for mum and dad. Ensure you bean bags are great quality, we bought a set a couple of years ago with thin fabric, which soon frayed. 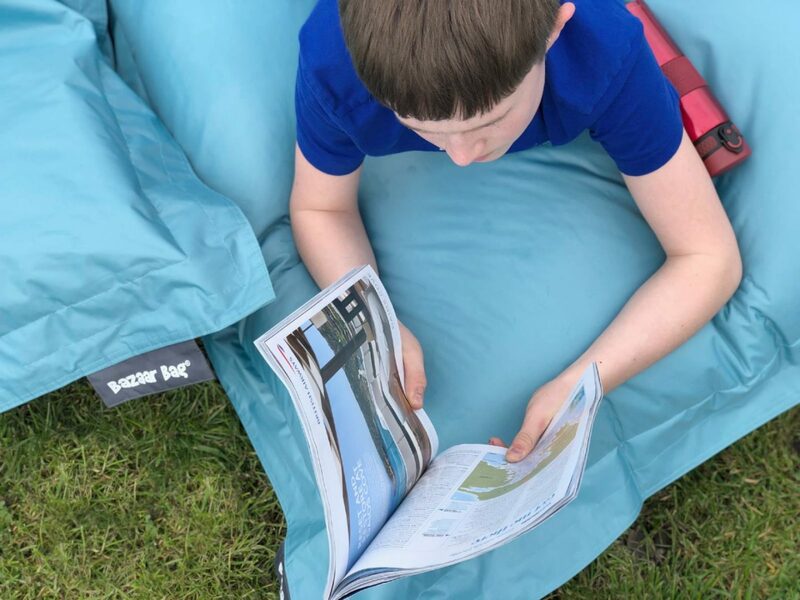 However the bean bags from Bean Bag Bazaar are great quality, with a thick wipeable surface, which is vital when living with messy kids and teens. And whilst I am all for spending time in the sun its important to have shaded areas, extra large parasols are fantastic as you can move them around the garden. However if you have little shade in your garden and sail will create a shaded area and look super stylish. Stock up on bbq coal, or gas. Get all the trays in the dishwasher and ensure the BBQ is scrubbed up and ready. It is also a great idea to by a big supply of BBQ sticks as they sell out once BBQ season gets going. Solar lights and lanterns are the perfect way to make summer days last longer. And who doesn’t love summer evenings in the garden? Solar lights make so much more sense in the summer, adding lights is the perfect way to get your garden ready for summer evenings. This is our plan for the next 2 years, we plan to add some quirky decorations to give our patio area a vintage look. Maybe a rustic garden mirror and a few understated statues and garden arches to create pockets in the garden. 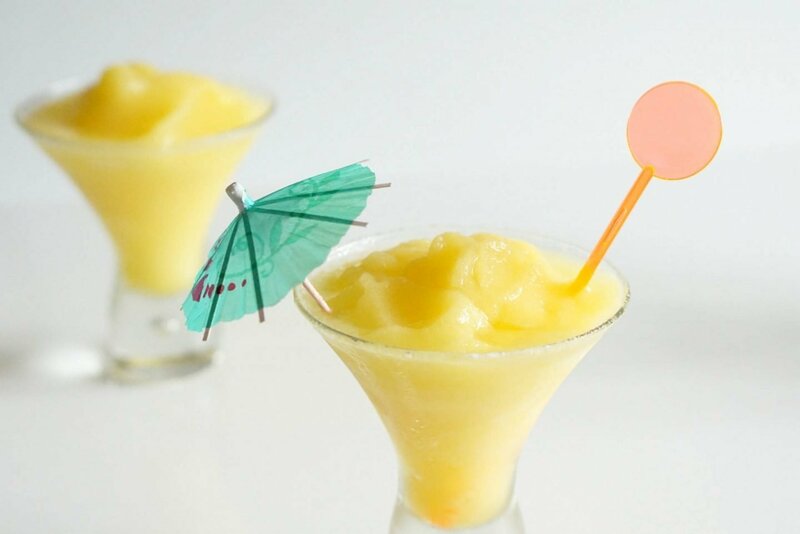 And there you have it a few simple steps and a little preparation you will be ready to chill all summer long. Next step is to get practicing cocktail recipes. 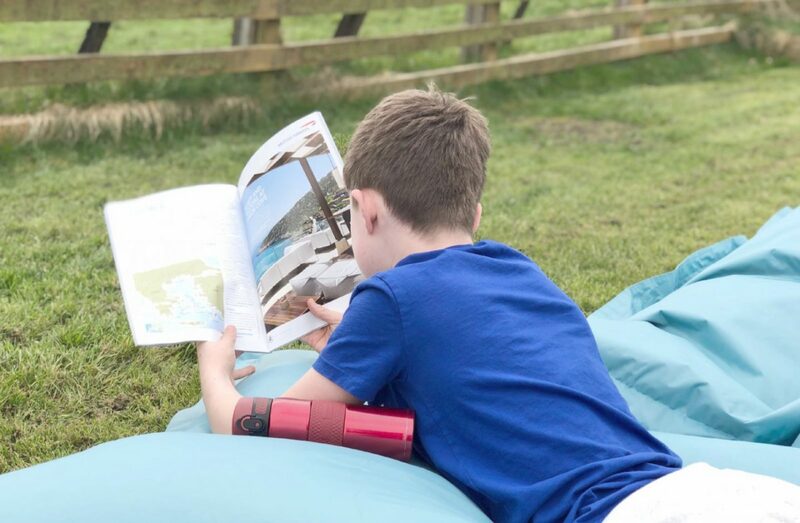 I am also thrilled to be able to offer on of my readers the chance to get your hands on a Gian Garden bean bag of your very own in your choice of colour by entering via the rafflecopter good luck. Disclaimer, I was gifted the bean bags for the purpose of this post, however we do always have chill out beanbags area in our garden.